Yes, my friends, it's true! The latest Father Tim novel has been released (today!) It's been three years since we've heard from Karon and it was some (minor minor minor) degree of excitement that I accepted and received a copy of In the Company of Others from Viking Press to read and share with you. I eagerly dove into this story where we find Father Tim and his lovely wife, Cynthia, making their long awaited trip to Ireland. Given the fact that it had been three years since my last visit with Father Tim, I wasn't sure if I would need a refresher, but it was easy to pick up where I had left off and breeze along through this story. Jan Karon describes In the Company of Others as being her "personal favorite" of all of her stories. She refers to this one as her "dark-haired child." I can't say that it was necessarily my favorite but I certainly was not disappointed! Father Tim and Cynthia vacation in a guest lodge and anticipate a time of quiet rest before traveling around Ireland with Tim's cousin and his wife. However, Cynthia suffers a severely strained ankle due to a mysterious incident (don't want to give away spoilers here!) at the guest house and so the entire book takes place in one location. This was perfectly fine by me and I enjoyed both the scenery and the characters which they surrounded themselves with during their stay. 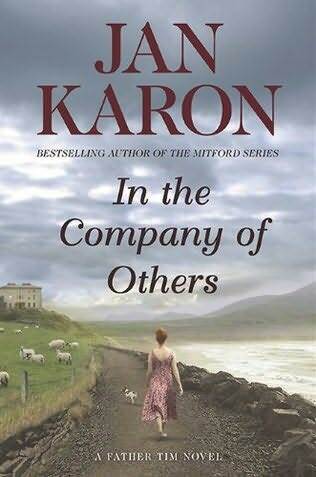 I find Karon's novels to be calm and peaceful, even if there is a bit of dark mystery about them. You just feel relaxed when reading her books. At the same time, I would harbor one complaint against this particular title, if I may, and that was that the dialogue was rather difficult to follow. I don't remember this from her other books, but she bounced around from characters some, so that I had difficulty figuring out who was saying what. She wrote streams of conversation without interjecting who was doing the talking so I frequently found myself having to re-read various parts to figure out what was happening. After awhile, I figured out that I could plow on through the conversation and make sense at the end of it. That was a surprising find for me in this book, but it didn't take away my joy from the basic story. If you like Mitford and you like Father Tim, well, then you are definitely going to want to pick up a copy of this book. It is a delight. I have some good news for those of you who love Karon's works! Viking Press has offered to give away one copy of In the Company of Others to one of you! Would you care to win? (Of course you would!) Simply leave a comment below. This contest will be open through Tuesday, October 26th and is open to U.S. Residents only. THIS CONTEST IS NOW CLOSED. THE WINNER, as selected by random.org, IS #26 - Cacey! CONGRATULATIONS! I just read my first Jan Karon novel this year (!!!) and LOVED it, so sign me up! This looks like an awesome read! Would love to win! Thank you for this giveaway! I, too, would love to win! Oh, my, yes, sign me up right away! Count me in on the giveaway -- I confess that I haven't read any Jan Karon yet! (At least, not for grownups. I did read Jeremy: The Tale of an Honest Bunny.) Definitely interested in this one! Thanks for the review! I'd love a copy. Yes please! Love Jan Karon! My MIL loves this series. Please add me to your give-away. I've read several in the series, but not them all. I need to get back to them. I looove this series! Thanks for the heads up on the new book, the review and the giveaway! I have not yet read Jan Karon, but I would love a chance to win this book and put her on my to be read list! Of course I would! Because my mother-in-law introduced me to Jan Karon and Father Tim and Mitford and I read all of them in one summer just a couple years ago! I absolutely cannot WAIT to read this book! Choose me, please!!! Please enter me in the giveaway. I love Jan Karon's books. I love that this book is set in Ireland. Please include me! Yes please! Throw my name in the hat! Oh, so excited that there is a new book! Please add my name to the list! This book sounds so good. Thank you for the chance to win it. I have not yet read a book by Jan Karon, but she's on my list of to-reads, since my sister liked her writing. I didn't realize Jan Karon was coming out with a new book - how fun! Thank you for offering this giveaway. I'd love to be entered, please. I love books by Jan Karon. She's the greatest. Thanks for the giveaway. Oh I love her books and would love a chance to win this latest book. We just don't have it in the budget right this minute for me to go out and buy it myself so it would be a real treat if I won. Oh, yes -- I would LOVE to read another Jan Karon novel. She's great. Enter me! Thanks. I would love the chance to own this book. Please enter me!!! I like calm, peaceful, and relaxed, but is this a book you can read without having read the ones before it? Jan Karon books are very rewarding reads. I would love to read her latest. I have read most of Jan Karon's books. Would love to read her newest. My mom and grandma LOVE the Jan Karon books! They say Mitford is just like the little town of Cabool they live in! i so love jan karon,,,they are so peaceful and fun! Carrie's comment that 'the dialogue was rather difficult to follow', is my main comment, too. I've loved all of Karon's other books, which is the only reason I didn't give up on this one! But otherwise, I probably wouldn't have finished it. I wasn't sure if it was Karon or me, so I was glad to find this comment - I hadn't just imagined it to seem so confusing!